Don’t feel bad if you haven’t heard of Opera Solutions; you’re in good company. However, the analytics-as-a-service provider has quietly built up a $100 million company since 2004, and with big data on the tip of the IT world’s collective tongue, Opera is ready to start spreading the word. Good thing it has a compelling story to tell. The most important aspect of Opera is its product, which is a custom-built stack of big data components that form the analytics engine that powers its subscription-based service. 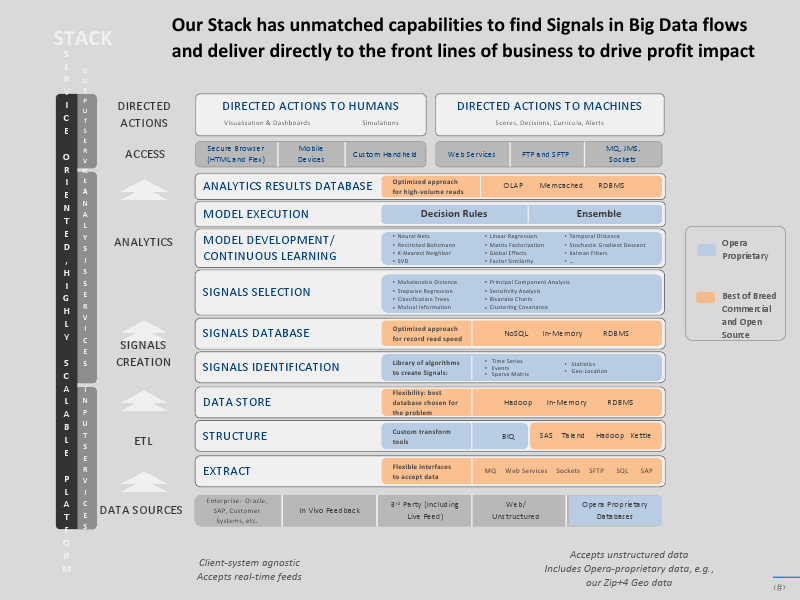 As the image illustrates, that stack includes everything from Hadoop at the foundation to NoSQL to store “signal” data to Opera’s proprietary machine-learning and execution software. Opera’s service is housed in its own data centers, although the company does partner with Amazon Web Services (s amzn) for times when additional capacity is required. The way it works is rather unique: Customer data is streamed to the Opera service, which then processes that data and directs human decision-makers or machines to act according to what the software determines. For example, the company helped a large automobile company that, as part of its business, sells used cars at auctions. Opera built an application that delivers real-time pricing information to company representatives via their iPads (s aapl) so they can ensure they’re getting the best price. In another deployment, Opera helped a grocery store chain improve static sales via a personalized recommendation system for customers. When you boil it down, Gupta explained, there are only about nine classes of big data problems that can be solved in about five different ways, but there are infinite manners in which they come about in any given situation. That’s why Opera utilizes a modular technology stack in which the various core components (e.g., Hadoop or a relational database) can be plugged in or pulled out based on that customer’s needs. It’s also why Opera carefully monitors each customer’s data environment to select the most-appropriate signals that will feed Opera’s predictive analytics and machine-learning engines. Last year, Opera made 1.2 billion recommendations to customers, managed 160 TB of data flow every week and had 100 predictive models running at any given time. According to Laura Teller, chief marketing officer, part of Opera’s revenue is directly tied to the results it achieves for customers. Gupta says he’s driven by the idea that advanced analytics will transform the business landscape over the next decade. He draws a comparison to the world of medicine, where experts have predicted that the advent of genomic mapping empowered by high-performance computing and big data will result in a degree of change between 2010 and 2020 comparable to the degree to which the periodic table of elements changed chemistry. With that in mind, Gupta is building up a team of Ph.D. computer scientists that currently numbers more than 150 and is possibly the largest collection this side of IBM (s ibm). Scientists go through a five-step interview, which includes evaluation and defense of their doctoral theses. A team of Opera employees actually finished as runner-up, in a statistical tie, in the $1 million competition to improve the accuracy of Netflix’s (s nflx) recommendation algorithm by 10 percent. In order to assure ideal analytics for each customer, though, Opera also employs a team of domain experts, software developers and big data specialists. Although the company has been self-funded thus far, Gupta says it’s now going after “serious investment” to capitalize on the opportunity in front of it. He says Opera has received interest from some significant investors already, and I don’t doubt him for a second. I wrote recently how big data and cloud computing are converging, and Opera is a prime example of this trend. The market of big data components such as Hadoop and analytic databases is filling up fast, but Opera is two steps ahead by utilizing those tools to deliver actual insight as a service, and that’s where the next round of big data innovation will be.